(Ohio, 2008) xi + 375 pp. Reviewed by Amy Robinson on 2009-09-01. What makes a luxury necessary, and why did historians of tea in the nineteenth century call it a "necessary luxury"? Raising these questions in the very title of her book, Julie E. Fromer explains that while tea was initially considered a foreign, exotic luxury food, its increased availability and popularity in the eighteenth and nineteenth centuries made it a necessary part of everyday, domestic life (4-5). While previous scholarship on Victorian tea drinking, such as Roy Moxham's Tea: Addiction, Exploitation, and Empire (2003) and Alan Macfarlane and Iris Macfarlane's The Empire of Tea: The Remarkable History of the Plant That Took Over the World (2004), "popularize the intriguing history of tea," they fail, according to Fromer, to "analyze that history or cultural context" (2). More precisely, they privilege its imperial role over its domestic function. By contrast, Fromer studies not only its imperial role but also its place in nineteenth-century histories of tea, in advertisements, and in fictional scenes of characters drinking tea against a "larger backdrop of depictions of tea in nineteenth-century everyday life" (17). She thus aims to show that representations of tea in English culture create moments of "communitas" (17). Tea, Fromer argues, is worthy of study because of its quotidian nature, not despite it. To become quotidian, tea had to be domesticated. In the nineteenth century, Fromer explains, tea became an icon of the English home even as England worked to gain economic and political control of its production (10). To allay fears of adulterated, foreign, Oriental tea, English merchants increasingly shifted from importing Chinese tea to expanding the empire by cultivating tea from an imperial source: India. This imperial move served domestic needs. 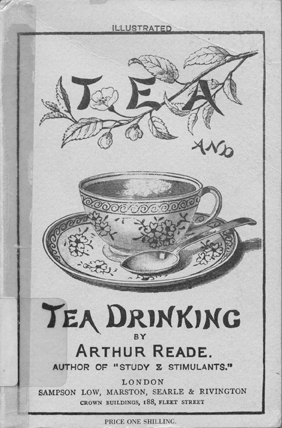 As Fromer notes, England's capacity to Anglicize and domesticate foreign commodities like tea is exemplified visually on the cover illustration of Arthur Reade's Tea and Tea Drinking (1884) (Figure 1.3, p. 45). Though the illustration is framed in Asian lettering and cherry blossoms, the teacup in the center is distinctly English, complete with the English trappings of handle, saucer, and teaspoon (44-46). Does tea really-and always-break down boundaries and create a sense of community? One of the main ideas of Fromer's book is that tea table rituals function in many ways as "liminal (or threshold) rituals," breaking down such binaries as masculine/feminine, public/private, middle class/lower class, foreign/domestic, and necessity/luxury (11). But as Fromer explains, while Victorian tea histories offered "ideal visions" of tea's ability to erase certain boundaries so as to create a shared community, fictional scenes of tea drinking show that the class-structured and gendered moments of preparing tea are still "complicated and embroiled in personal perspectives and potential misinterpretations" (18-19). Fromer's analysis of Gaskell's North and South shows how liminal spaces are opened up and a sense of community achieved. By providing a "shared cultural experience that soothes differences," the tea table "unravels the binaries of masculine and feminine, public and private," allowing Margaret Hale and John Thornton to discuss . . . class conflict in the domestic sphere (126). Yet Fromer makes no mention of another Gaskell novel full of tea scenes: Cranford. To what extent does tea drinking-including the tea shop Miss Matty runs in her home-break down binaries and foster community in the village of Cranford? Fromer herself admits that tea fails to nurture social cohesion in novels such as Alice's Adventures in Wonderland, Middlemarch, and Jude the Obscure. To take one example, the well-known "Mad Tea-Party" represents "everything that a tea party is not supposed to be" (169). Alice isn't actually invited to the Mad Hatter's tea party and consumes nothing, thus leaving unnourished and irritated, having failed to form any kind of connection whatsoever. Whether nurturing community or failing to do so, tea also serves other ends. In both Victorian histories of tea and Victorian novels, we are told, the preparing and serving of tea simultaneously affirms and challenges specific gender roles. One the one hand, Victorian histories of tea follow the gendered dynamic wherein men produce income and wives consume the goods necessary to run a household; on the other hand, these same histories also suggest that more than other beverages, the serving of "light and innocent" (105) tea helps women produce domesticity while their husbands consume domestic peace and tranquility (101). One fictional example of this gender dynamic at work is Dickens' David Copperfield, which shows that women must carefully balance their sexual appeal and maternal nurturance at the tea table (180). The eponymous hero, Fromer argues, "negotiates his relationship with the feminine" (especially Emily, Aunt Betsey, and Dora) during tea time (181). Noting that David is said to be "steeped" in Dora (qtd. 194), Fromer concludes that "Dora is tea," and represents the "possibility of spiritual, emotional, and sexual nourishment combined" (194). But given her inability to manage a home later on, is it not ironic that Dora is associated with the domestic tea table during her courtship with David? Fromer clearly has trouble making David Copperfield fit her thesis. Since Agnes, David's second wife, is never associated with the tea table, Fromer concludes that she fails to furnish the spiritual nourishment David needs. Why then does he marry her? Is she truly incapable of supporting or nourishing David? Here Fromer forgets what she has already said elsewhere: that Victorian fiction complicates the linkage between tea table and community. Nevertheless, she herself complicates her argument that tea leads women and men into untraditional roles-man as consumer, woman as producer. In Margaret Oliphant's Hester, Fromer contends, these same roles can be stifling. As exemplified by the eponymous heroine and her cousin Edward, the rituals of the tea table in this novel reduce women to "nurturing producers" and men to "consuming dependents" (242). Marking a new interest in a topic also treated by Judith L. Fisher (see "Tea in Literature"), this study amplifies the growing body of scholarship on the Victorian everyday and material culture. 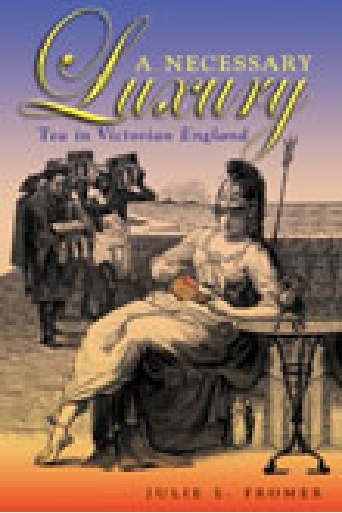 While not always convincing in her reading of fictional tea scenes, Fromer suggestively links them to the cultural context of tea and the larger and more well-known themes of the novels in which they appear. Above all, Fromer persuades her readers that the everyday cup of tea played a much more crucial and complex role in Victorian society than they may have thought. Amy Robinson is Visiting Assistant Professor of Literature at Eckerd College in St. Petersburg, Florida. It is a pleasure to have the opportunity to respond to Amy J. Robinson's review of A Necessary Luxury. By offering a place to review and discuss recent publications, as well as by giving authors a chance to participate in the conversation, New Books on Literature 19 plays a unique and welcome role in academic publishing. Robinson highlights my focus on tea drinking as an essential, but critically overlooked, part of Victorian culture. She traces my analysis of the shift in English sources for tea, from foreign merchants in China to British plantations in India. Robinson then centers her review on my argument that scenes of tea drinking in novels often create communitas, breaking down many of the binaries that structured Victorian culture, including those of gender and class. As she points out, my reading of Elizabeth Gaskell's North and South suggests that these binaries are successfully elided and communication between the classes can and does occur. But Robinson suggests that I am always looking for communitas in literary tea scenes, and that when I cannot find instances of successful communication, I am forced to "admit that tea fails to nurture social cohesion." Robinson highlights my analysis of the "Mad Tea-Party" chapter in Lewis Carroll's Alice's Adventures in Wonderland as an example of my search for communitas faltering in the face of the textual evidence. I do not, however, argue that tea always creates communitas-that kind of consistency, as Robinson shows, would be unsubstantiated by the literary texts. Instead, I focus on the idea of expectations. All of the novels I discuss share an expectation that tea is supposed to create communitas-an expectation shared by textual sources, by characters, and by authors and imagined readers. Drawing evidence from nineteenth-century histories of tea and contemporary periodicals, I argue that an idealized image of the tea table as a warm and cozy space of intimacy and solace was well established by the early part of the nineteenth century. We see literary evidence of these kinds of scenes in, for example, William Cowper's The Task, first published in 1785, and Thomas DeQuincey's Confessions of an English Opium Eater, first published in London Magazine in 1821. (My discussion of Cowper can be found on pages 95 and 250-254 in A Necessary Luxury. I refer to DeQuincey's idealized portrait of the tea table throughout the first half of the book; see especially 42-44.). Nineteenth-century authors and readers were well acquainted with this cultural ideal of tea as a source of connection and comfort. Within my literary analysis, I suggest that many authors utilized this cultural ideal-purposefully raised the specter of communitas-in order to question it, problematize it, and undermine it. In the case of Carroll's "Mad Tea-Party" chapter, then, my analysis relies upon reading Alice as unsuccessful in achieving the succor she had hoped to find at the Mad Hatter's tea table. The power of this chapter to shock and provoke Alice to anger, as I point out in my analysis of this scene, depends upon the mental image-shared by Alice and the readers of Carroll's novel-of what is supposed to happen at a tea party. I explore how Carroll manipulates the details of the perfect tea party in order to present his utterly nonsensical, completely non-nourishing version of it. As each expectation of communitas is denied and shattered, Alice's discomfort (and the readers' recognition of this discomfort) increases. Robinson also questions my analysis of Charles Dickens' David Copperfield. Since Dora is elaborately linked to tea in metaphor and description during David's courtship, her subsequent failure as a housewife would seem to be "ironic," according to Robinson, who suggests that I have not accounted for this irony in my analysis. On the contrary, I am once again relying more on the concept of expectations than fulfillment. I do not argue that Dora does in fact fulfill David's goals of combining "spiritual, emotional, and sexual nourishment" (194). Instead, I argue that David himself has unrealistic goals-he envisions Dora as his ideal female partner, and he misreads her performances at the tea table as evidence of her perfection as a Victorian woman, complete with sexual appeal and domestic abilities. I interpret this as evidence of David's own gullibility; he has been convinced by literary and cultural scenes of the ideal tea table to expect that a woman's way of serving and drinking tea reliably signifies her character. the tea table in later scenes in the novel, David has given up his hopes of finding the complete sexual and domestic ideal; he marries Agnes because he has relinquished his ideal of the perfect tea-tablepresided over by a perfectly complete woman. (Interestingly, however, the novel does give us a glimpse of the successful union of sexual and domestic compatibility in the image of Tommy and Sophie Traddles. Tommy's more humble search for happiness, rather than perfection, does seem to result in the felicitous tea table that David so desires [see page 197]). David Copperfield, of course, is not the only nineteenth-century character to persist in hoping that this ideal might be realized. As I discuss in a later chapter, Jude Fawley pursues a similar ideal throughout his career. Jude's initial steps off of the path towards Christminster are hastened by his expectations of tea and womanhood, and Hardy continually associates both Arabella and Sue with the tea table throughout the novel. (See my discussion of Jude the Obscure on pages 275-288). As Robinson suggests, my work on tea offers the first sustained literary analysis of the complex cultural context of tea in Victorian fiction. In A Necessary Luxury, I have traced some of the patterns of tea drinking in Victorian literature, arguing for the importance of investigating the interconnected local and global issues of consumption patterns in Victorian culture. Leave a comment on Amy Robinson's review.